This month, explore the pyramids of Egypt, avoid the mummies protecting the treasure within, and win some of the $80,000 in casino bonuses that Jackpot Capital Casino is giving away during it's Pharaoh’s Treasure casino bonus event. Earn reward points when you play any of the games from Realtime Gaming at jackpot Capital and you'll be ranked by your points on a scoreboard. You'll earn scoreboard points when playing in the online casino or in the mobile casino. Every Monday, $15,000 in bonuses will be awarded to players with the most points – up to $500 each every week. Another $5000 in Friday Random Bonus Boosts give even occasional players a chance to win some bonus cash. Bonus reward frequent players but there are random draws that even occasional players can win too. 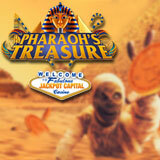 Pharaoh’s Treasure casino bonuses continue until November 7th.